1. IPPB related button are disabled or not visible. Soln. Today(9th August) we have enabled IPPB in all the offices PAN INDIA, kindly run daily sync to get it enabled, then kindly install SSL_Certificate. 2. Connection timed out error . Soln. IPPB related port opening night have not happened or some issue with network of that office, please check with IPPB team. 3. "Connection timed out : SSL handshake Exception" error message . Soln. Please install SSL_Certificate by following steps. 4. Any error message starting with "IPPB Error" for ex. IPPB ERROR: enter correct facility id"
integration is completed those trasactions will automatically flow to daily account of CSI. Any issues observed , please mail to csicct.cept@indiapost.gov.in. Railway Protection Force The request of MoR to submit a revised proposal has been acceded to by DoPT. They have been advised to submit the revised proposal within a month. Indian Defence Estate Service (IDES) MoD was requested for certain clarifications. The same have been received. The proposal is under examination. 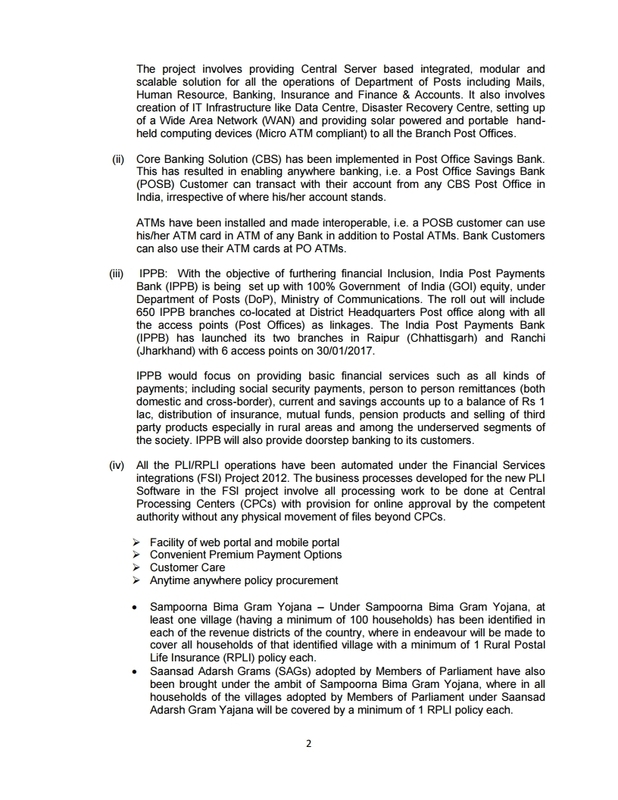 Indian P&T Building Works Approval of Secretary (Exp) has been obtained. Note for CRC is being sent. Indian Naval Armament Service (INAS) DoE has raised certain clarifications. Reply of MoD has been received which is under examination. 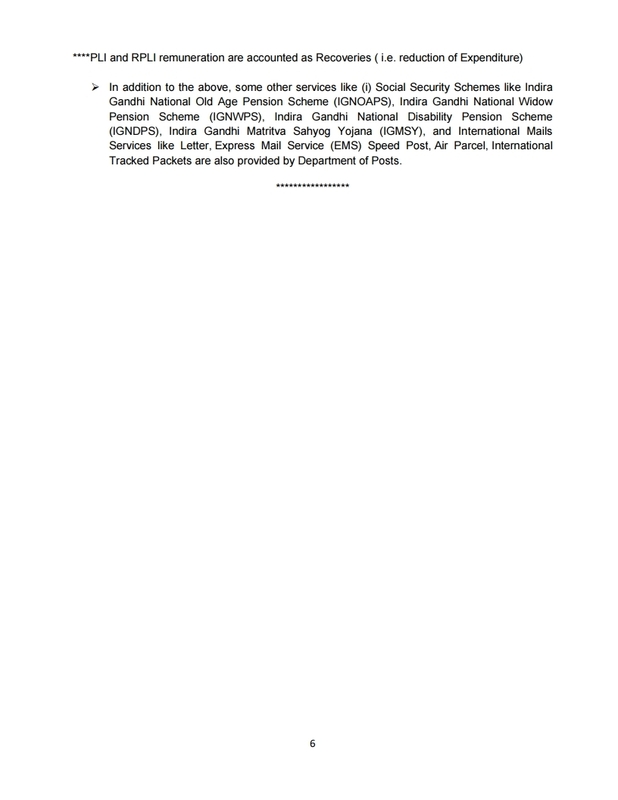 Indian Ordnance Factories Health Services (IOFHS) The approval of Secretary (Exp) obtained. Note for CRC is being prepared. Indo Tibetan Border Police (ITBP) The proposal is under consideration. Indian Economic Service DEA has been requested for certain clarifications vide this Division's OM dated 10.07.2017. A DO reminder has been sent to DoEA on 15.05.2018. A subsequent DO reminder (at JS level) has been sent on 05.07.2018. The clarifications are yet to be received. Indian Railway Medical Service (IRMS) Proposal was found incomplete. MoR has been requested to send the complete proposal. Central Health Service (CHS) Proposal was found incomplete. MoFHW has been requested to send the complete proposal. Note: A calender of cadre review has been issued vide OM No.I-11019/9/2018-CRD dated 25.05.2018. 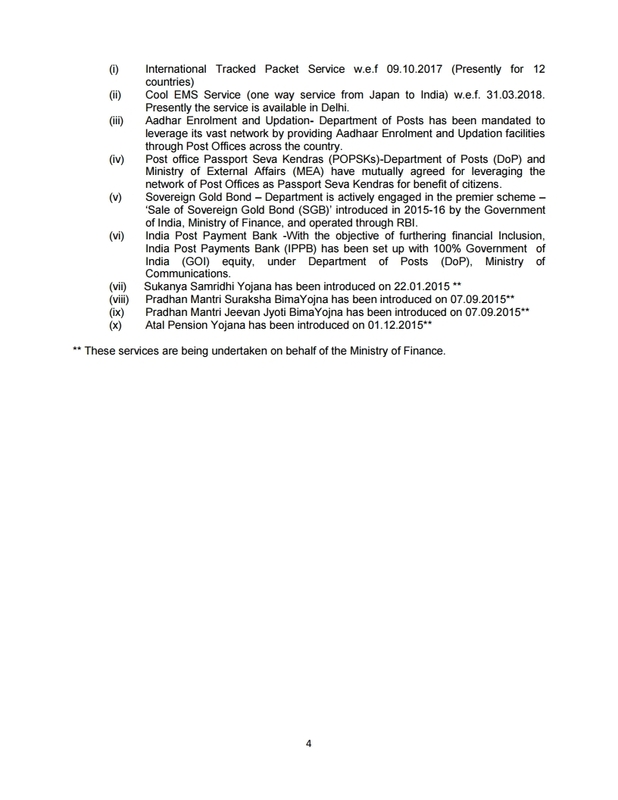 The name of the Service/Cadre along with the month by which cadre review proposal is required to be submitted to DoPT is mentioned in the Annexure. The aforesaid OM dated 25.05.2018 is available on the official website of DoPT i.e. 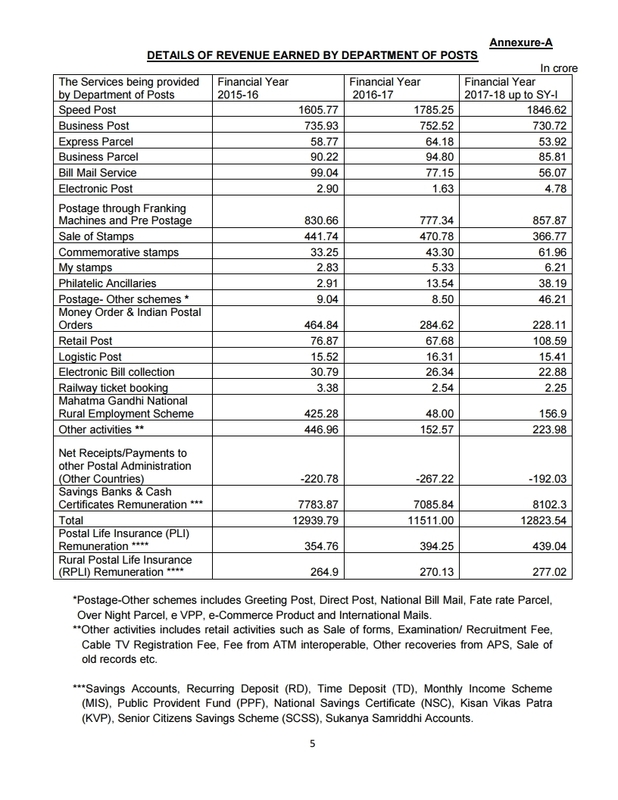 www.dopt.gov.in (Link: Notifications - OMs & Orders – Cadre Review – Division – General Circulars) . The Cadre Controlling Authority may take immediate action for compliance. 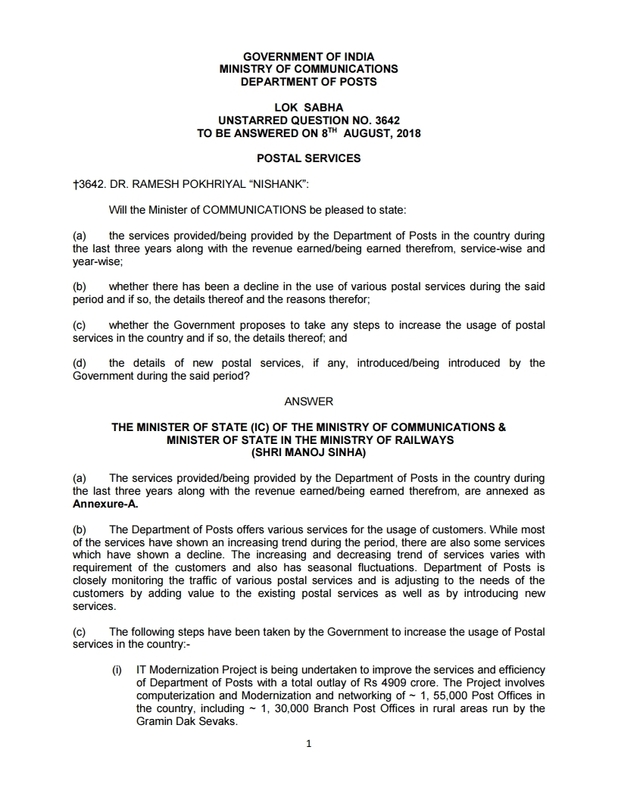 Lok Sabha Q & A dated 08 Aug 2018: Postal Services in the country - New Product, Revenue Earned and Proposal to increase the usage of Postal Service. 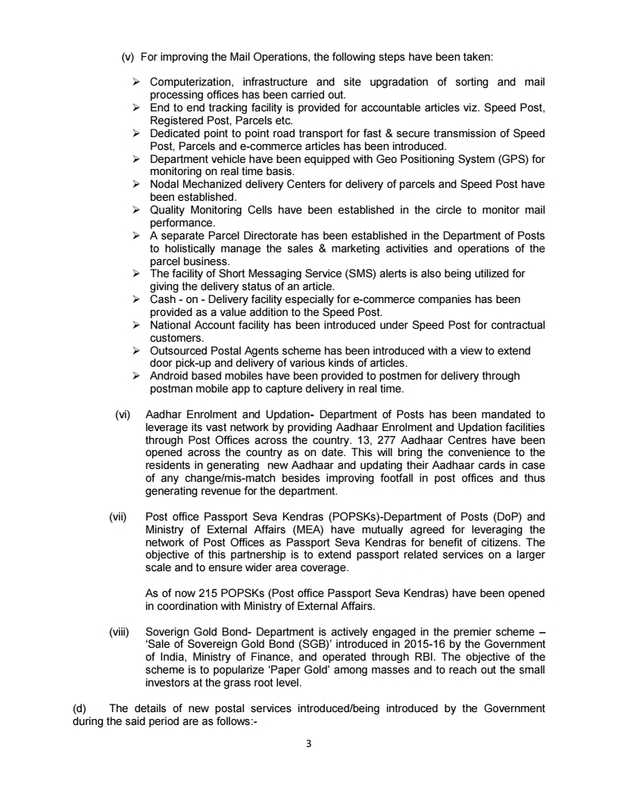 (d) the details of new postal services, if any, introduced/being introduced by the Government during the said period?